NASA’s Mars Reconnaissance Orbiter has taken a picture of what they say is an elephant, but looks more like a young mammoth to me. My artistic input was merely to give the original black and white photo a reddish tint for atmosphere. It’s the low gravity whut lets ’em grow so big. This observation highlights Martian terrain that looks like an elephant. Actually, this image covers the margin of a lava flow in Elysium Planitia, the youngest flood-lava province on Mars. Flood lavas cover extensive areas, and were once thought to be emplaced extremely rapidly, like a flood of water. Image released April 4, 2012. The dried flood of lava over the surface of Mars has created the spitting image of the eye and trunk of an elephant. The curve of the animal’s forehead and the dent of an ear also appear in a new photo taken by the High Resolution Imaging Science Experiment (HiRISE) on NASA’s Mars Reconnaissance Orbiter. “This is a good example of the phenomena ‘pareidolia,’ where we see things (such as animals) that aren’t really there,” University of Arizona planetary geologist Alfred McEwen wrote in an update posted on the university’s HiRISE website. 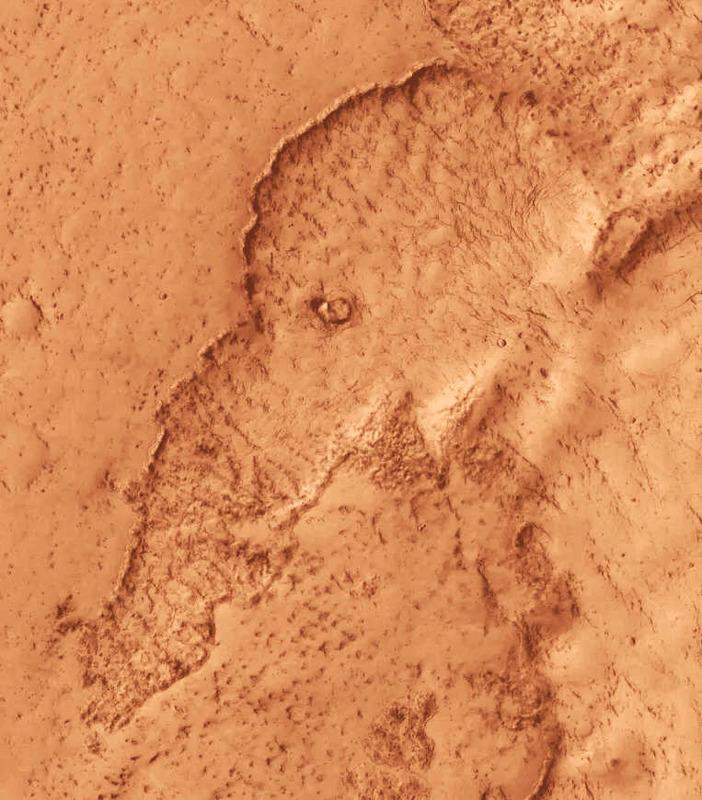 The Mars elephant illusion photo shows a region of the Red Planet called the Elysium Planitia, which is the youngest flood-lava province on Mars. Scientists aren’t sure if the lava flows on Mars were deposited quickly, or over a longer time period, as is the case on Earth, where most lava floods were put in place over years to decades. 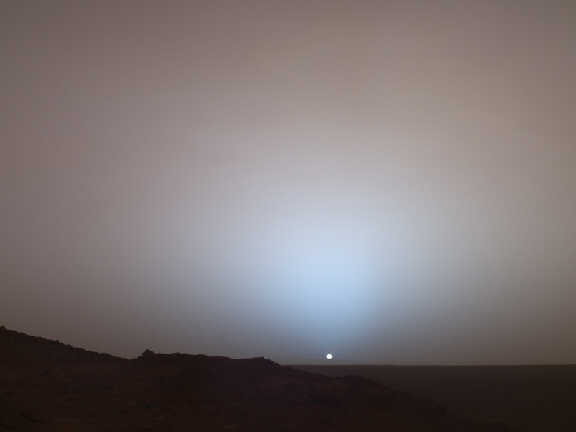 The Mars Reconnaissance Orbiter, which has been circling the Red Planet since 2006, was launched in 2005. The orbiter, currently in an extended phase of its mission, has transmitted more data to Earth than all other interplanetary missions combined, NASA officials have said. 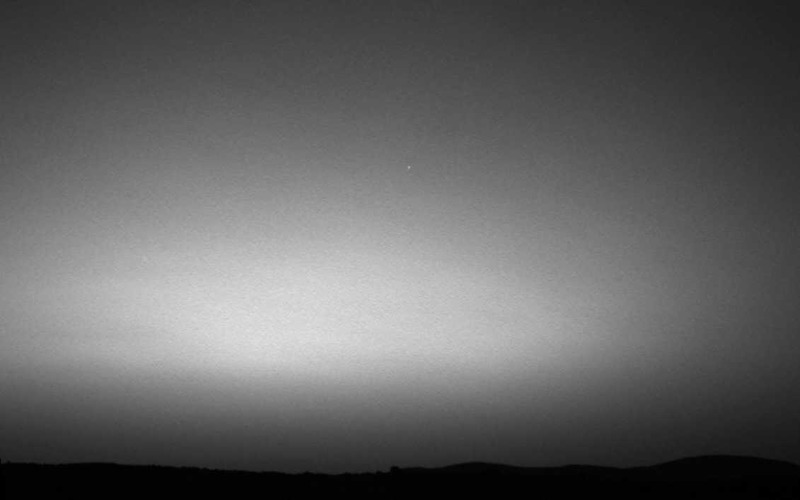 The Earth is the small dot near the center of the photograph. I don’t know if you’ve seen them; those pictures taken by NASA’s Cassini probe of the geysers on Saturn’s sixth largest moon Eneceladus. If not, look them up on the Internet. Enceladus is one of several moons of the outer planets which have water oceans under their surface ice. The scientific community believes life may exist in Enceladus’ ocean; it contains salts and organic compounds. Lot’s of living things there though my friends tell me the terms “plant” and “animal” don’t exactly work to describe them. Though it is heated by gravitational stressing and radioactive decay the water is rather frigid – that’s my excuse for including it on this blog. 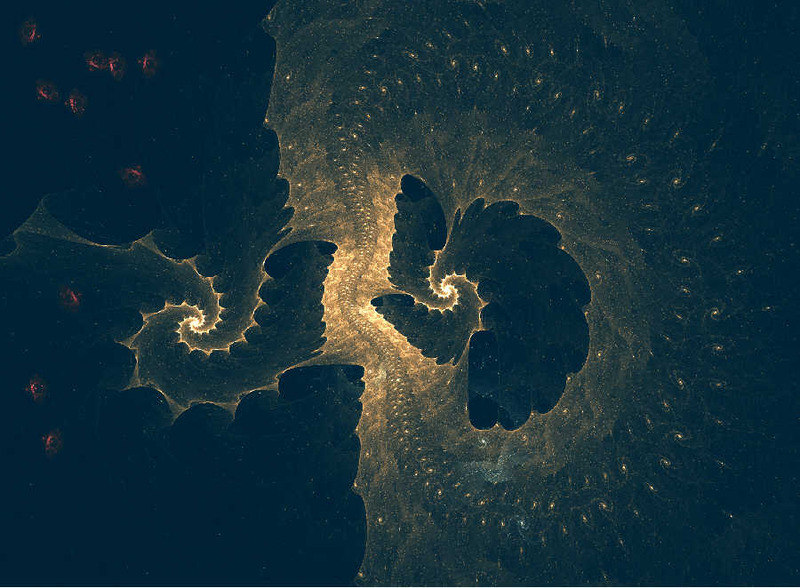 Sometimes the simplest fractals work really well. 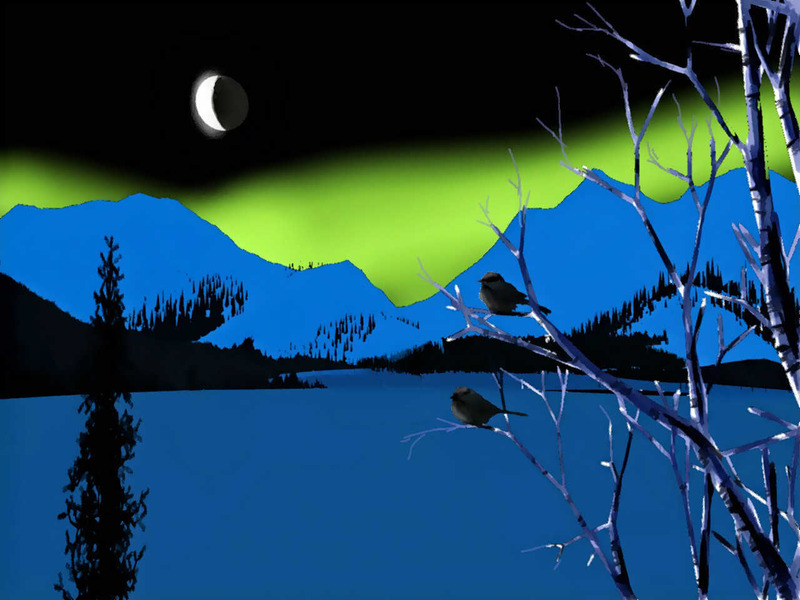 Last night was the winter solstice; the high point (or low point) of the long dark. I made this quickie image to celebrate the fact that today we had two seconds more light than yesterday. How do those chickadees – little, tiny fluff balls that they are – survive the winter? Cick on image for full-size view. The shortest night of the year. 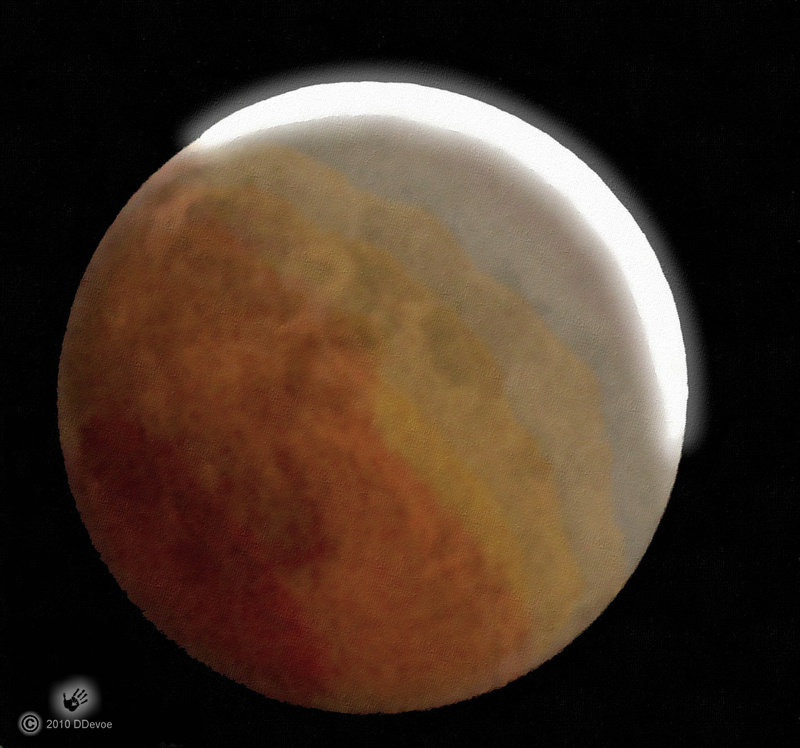 There was a total eclipse of the moon on December 21, 2010. Here in Anchorage we were lucky to have clear skies and not too cold, just a bit below zero.